We are occupied in providing a broad series of XLPE Cables up to 420 kV AC. These products are enormously admired by our customers for their easy to use and longer service life. We are offering Copper Flexible Cables to our clients. 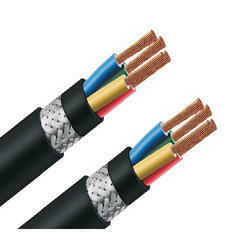 We offer High Tension Xlpe Cables. Technological up gradation and polymer revolution has replaced the conventional paper insulated cables and thermoplastic insulated cables with cross linked polyethylene (xlpe). The ht xlpe cables have better electrical, mechanical and thermal properties with reduced cable weight and dimensions. XLPE Cables, Cables, Conductors, Wires & Accessories, provided by J.I Integrated solutions. - 50 Sq.mm to 1000 Sq.mm in Single Core Cables. - 35 Sq.mm to 400 Sq.mm in Multi Cores Cables. XLPE insulation has become popular as an insulation material in the 1970s. Suitable for operation at a temp.upto 90 deg. C.
Most commonly used insulation for all voltages from low voltage to Extra High Voltage. All the above cables are available with standard PVC outer sheath & special outer sheath with FRLS, FR & PE. Our LT XLPE Cables insulated heavy duty cables were introduced worldwide in mid sixties. These cables have overcome the limitations of PVC Insulated Cables such as thermal degradation, poor moisture resistant and thermoplastic in nature.